There must have been something in the water in Great Britain back in 1969 that inspired musicians to produce such an impressive number of landmark albums. Though best known to progressive rock fans for King Crimson’s seminal debut, the year saw the release of other essential discs for the history of rock in all its forms. Pentangle’s third album, Basket of Light, is one of those, though unfortunately it may easily fly under the radar of most listeners but dedicated folk-rock enthusiasts – which is a pity, because the album is nothing short of a masterpiece. Indeed, Basket of Light is everything a lover of progressive folk-rock might expect, and then some. Bert Jansch’s and John Renbourn’s fluid, jangling guitars weave seamless melodies, backed by Danny Thompson’s impeccable double bass work and Terry Cox’s precise, understated drumming, while Jacqui McShee’s enchantingly crystalline tones soar above the fray. 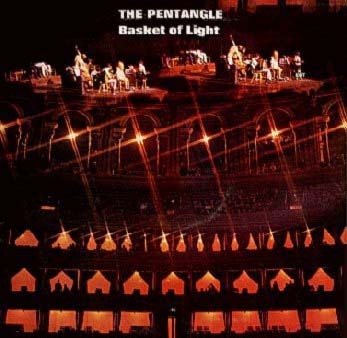 Though this is the recipe for all of Pentangle’s best output, Basket of Light possesses a cohesive nature that somewhat eludes their other albums, even as good as they are. Though more than half of the material featured here consists of rearrangements of traditional British or American folk songs, the band’s original compositions are shining examples of how those traditions impacted their creative process, allowing them to craft songs that are at the same time accessible and musically complex (though very subtly so, avoiding the over-the-top nature of too much canonical prog). The album’s title comes from a line of “Train Song”, probably the best-known number in the band’s output, and one of the original compositions previously mentioned. Indeed, the title describes the album quite aptly – it is an overall uplifting slice of music, though not in the quirkily humorous way typical of Canterbury bands. For instance, “Lyke-Wake Dirge” (as the title implies) is based on an ancient Anglo-Saxon funeral chant, and as such might be expected to be quite depressing – which is, however, not the case. With its gorgeous, three-part vocals and a delicate, barely perceptible guitar accompaniment, the song possesses a melancholy kind of beauty, yet is anything but gloomy. On the other hand, album opener “Light Flight” is a deceptively light and airy tune permeated by a faint sense of nostalgia, which follows some interesting rhythm patterns and introduces the listener to the delights of Jacqui’s vocals. Gentler and less assertive than Annie Haslam’s, but powerful in its own way, her voice possesses an authentic sweetness devoid of that saccharine aftertaste so rife in her modern followers. Interestingly, a good proportion of the album is dedicated to American music, in the shape of two folk songs derived from traditional English ballads (“Once I Had a Sweetheart” and the somewhat disturbing “House Carpenter”), and “Sally Go Round the Roses”, the only hit by New York girl group The Jaynetts, a delightful, feel-good tune (originally written by Phil Spector) showcasing a different side of Jacqui’s singing style. The latter is also present in two different versions as a bonus track, together with two other songs that, while penned by the band or individual members, are strongly redolent of the American musical tradition (especially the upbeat “Cold Mountain”). The aforementioned “Train Song”, written as a lament for the passing of the steam train, has a basic blues structure with vocal arrangements that reproduce the sound of a train in motion; while “The Cuckoo” is a traditional folk song from Somerset interpreted by Jacqui in piercingly sweet tones. “Hunting Song”, an original band composition based on traditional materials (namely an episode of the King Arthur cycle involving Morgana Le Fay and a hunting horn), is an almost seven-minute mini-epic sung by Jansch and McShee in their sharply contrasting timbres, and infused with the gently tinkling sound of the glockenspiel. In “House Carpenter”, which closes the original edition of the album, Renbourn’s and Jansch’s banjo-sitar interplay reinforces the sinister atmosphere of the tale of a young woman lured to perdition by the Devil himself. Ever since I was a child, I have been deeply fascinated by folklore and mythology, so my attraction to bands like Pentangle should not come as a surprise. On albums like this one, the music and the lyrics seem to mesh together seamlessly, and the sheer beauty of the vocals lends new intensity to those centuries-old tales of love, death, magic and treason. If, according to a popular stereotype, prog fans have an affinity for fantasy literature, then the root of it all is here, in the enthralling yet disquieting ballads interpreted by the exquisite voices of Jacqui McShee and her peers – as the father of modern fantasy, J.R.R. Tolkien, pointed out in many of his writings. In the previous paragraphs I have often used the word ”progressive’. So, can Basket of Light be really tagged as a prog album? Of course it can, though you should not expect anything resembling the likes of Yes or Genesis. We are not talking about lengthy epics with a pinch of folksy spicing thrown in for good measure, but rather about a genuinely progressive approach, where folk, blues, jazz, country and medieval/Elizabethan music are blended together with immaculate instrumental proficiency and vocals that achieve the perfect balance between technique and emotion. This is the kind of music whose progressiveness is made of subtle layers of light and shade, rather than a pile-up of flash and bombast. Indeed, many modern bands would have a lot to learn from this album – a masterpiece of class, expertise and restraint, and a delight from start to finish.